I guess I missed this because of high holidays, but FAB Defense has announced their 30rd AR-15 and AK magazines under the brand name of “Ultimag”. I’ve heard they’ve been in the wild for a few months, but expect a US appearance soon. The AR mag is your standard windowed polymer magazine. I assume it is meant for export to non-US countries, given the complete market dominance of the Magpul “pmag” in the USA. FAB Defense might also try to sell them to the IDF domestically – they bought 10k CAA mags a few years back, and I suspect there’s a lot more aluminum magazines to replace given how often they become unusable due to dents. 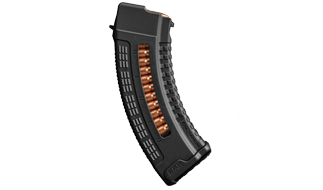 The AK magazine is similar to Magpul’s MOE AK magazine, which is to say it doesn’t have steel-reinforced locking lugs. On the other hand, it does have a window, which makes it unique. I have had some evolution on my views of the necessity of a window on a magazine, but I admit that it’s a feature which can be construed as reasonably helpful. I am skeptical it will see much take-up in the USA, but I could see buying one for testing.